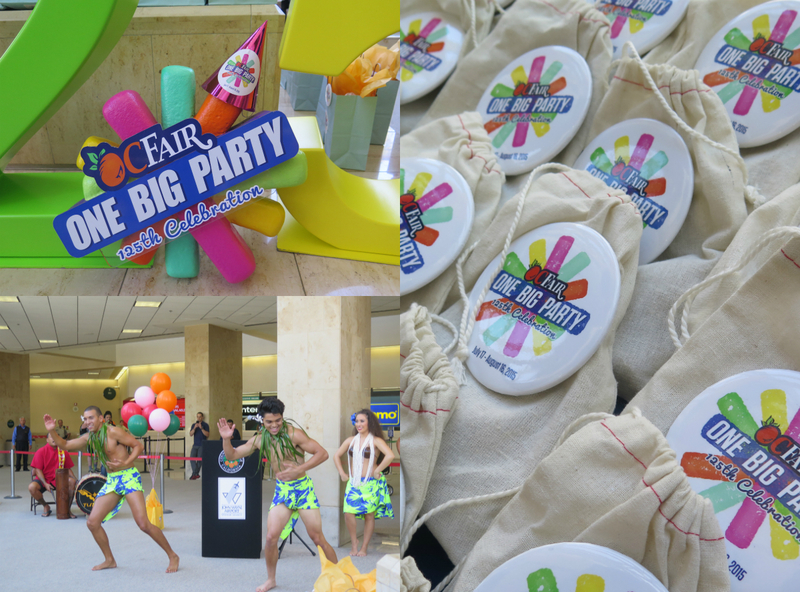 The OC Fair & Event Center debuted it&apos;s new art exhibit Fair Play at John Wayne Airport on Wednesday July 15, 2015, celebrating 125 years of its history. 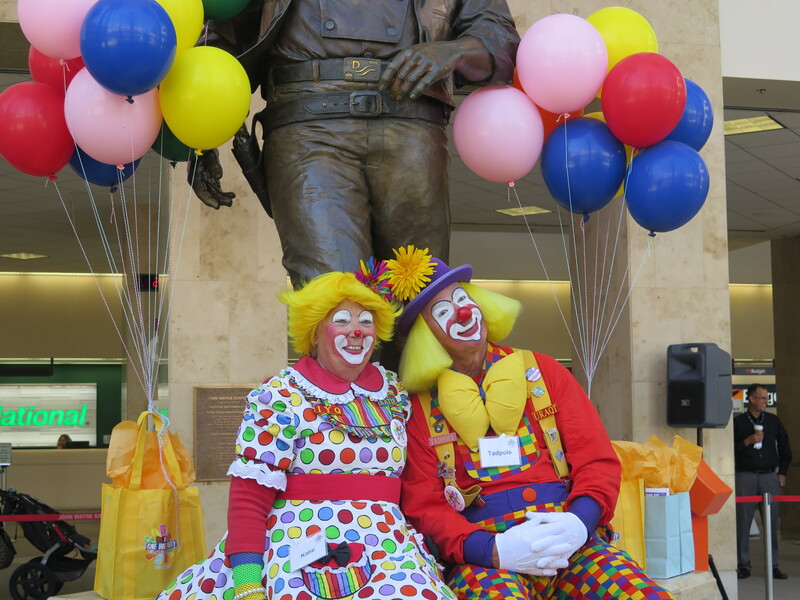 Members of the OC Fair, John Wayne Airport and the community along with cheerful clowns, petting animals from the Fair&apos;s Centennial Farm, Polynesian dancers and Olivia the Orange helped ring in this milestone and festive occasion. The fair is only one-year younger than Orange County itself and airport guests waiting to catch a flight or returning from a trip will be able to experience the OC Fair&apos;s rich and cultural history which in many ways parallels the history and growth of the County. Curated and designed by Stephen Anderson and Bolton Colburn, the exhibit is split into numerous display cases within the airport&apos;s Vi Smith Concourse Gallery which stretches from Gates 2 through 5 in Terminal A, Gates 18 through 21 in Terminal C and in the free standing cases near Gate 14. 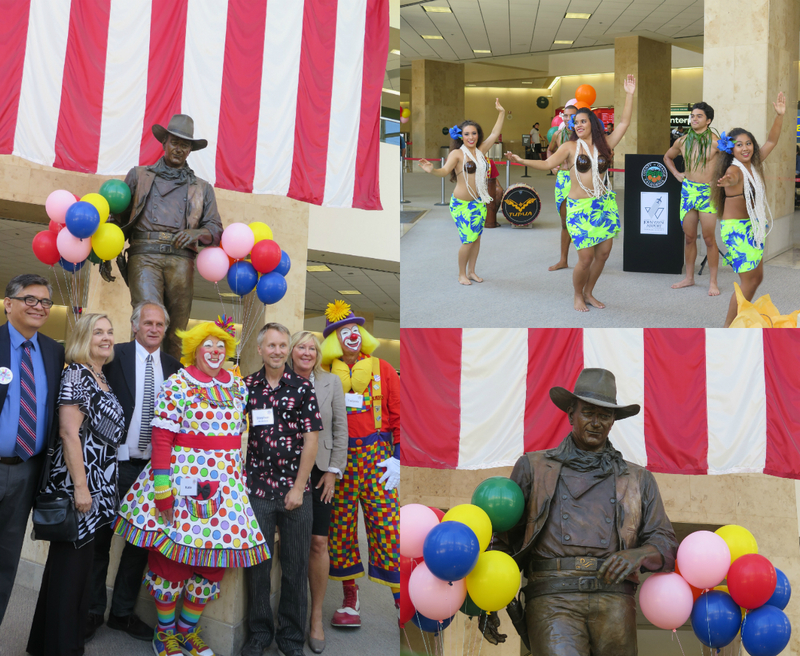 OC Fair members, exhibit curators and traveling clowns pose for a picture; Polynesian dancers from Tupua Productions performing for guests; the John Wayne statue surrounded by balloons. Aside from the art exhibit, the OC Fair kicks off tomorrow Friday July 17th and runs until August 16th. 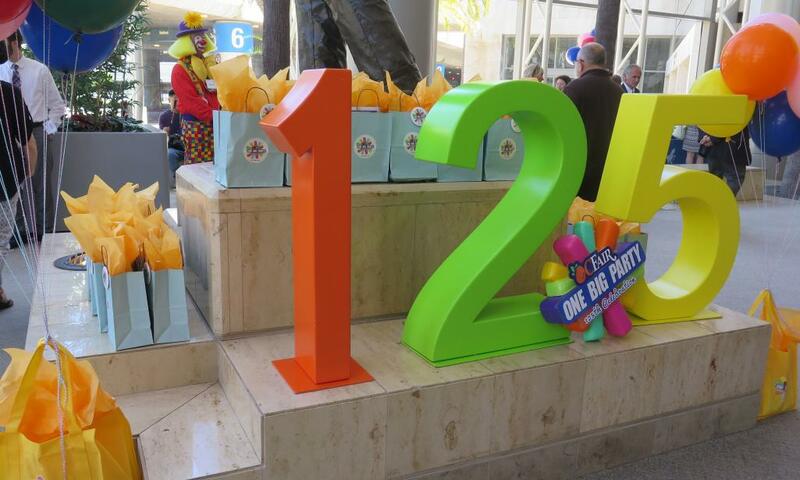 Don&apos;t miss out on the OC Fair&apos;s One Big Party- 125th Celebration. The fair promises to bring back our favorite rides, treats, and programming, as well as a few new and exciting attractions such as Fairenheit 32°, an ice skating rink and live ice carving area and the Cattle Drive which will feature more than a hundred cattle being escorted by cowboys and cowgirls on horseback through the streets of Costa Mesa and back to the fairgrounds. Visit the OC Fair website for more info!